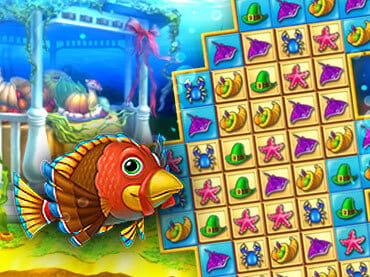 If you like this free game, try Fishdom Frosty Splash. Create your harvest Fishdom! Turn your aquarium into a welcoming farm with ripe vegetables and yummy treats. Win trophies and build up your heartwarming Fishdom! Get creative and decorate it with festive fishies and fall-time accessories. Download free full version game and get splashed with cornucopia of fun! - Extraordinarily addictive game play. If you have questions about Fishdom Harvest Splash game, please contact us using this form.